Earlier this year, scientists announced a major breakthrough: they have been successful in reversing the aging process in mice. While it’s hard to imagine the value of having increasing numbers of younger mice, the scientists’ focus is obviously on how this may someday benefit humans. Aging is a universal process. It affects every conceivable human experience. So when we hear that someone or something is actually getting more vibrant and more alive over time—that’s news. The story of the eighty-five-year-old Wheaton Bible Church is news, because it is more alive, more dynamic, more outward-focused than at any other time in its history. While the roots of our church go back to an earlier congregation that began on the campus of Wheaton College in 1860, our church was actually born on June 16, 1929. The 160 charter members decided on the name Wheaton College Interdenominational Church. 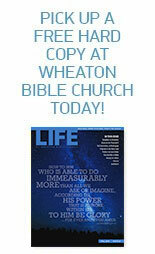 That name didn’t last long for various reasons, and a few years later the name was changed to Wheaton Bible Church. The intent was to emphasize the centrality of the Scriptures for our church while also communicating a mission larger than the Wheaton College campus. By 1936, we had built our first building at the corner of Cross and Union streets in Wheaton. This was an overwhelming confirmation of God’s hand on the church, because it was in the midst of the Great Depression that the 291 members gave, many with incredible personal sacrifice, to purchase the land and construct the 400-seat building at a cost of $30,000. The church’s annual budget of just under $7,000 that year reflected a commitment to both local ministry and global outreach, including the support of eight missionaries. The church continued to grow through the strong pulpit ministry of our gifted pastors, through dynamic Christian-education programs, and through an ever expanding outward focus on world missions. The growth of the 1940s through the 1960s was the catalyst for adding a Christian-education wing to our original building, and later a new sanctuary seating 1,300. During this same period, while we were expanding our own facilities, our church played a role in helping to start five nearby congregations. The congregations familiar to most are Pleasant Hill Community Church and Evangel Baptist Church, both in Wheaton, and Village Bible Church in Carol Stream. By the 1970s and 1980s, the church was continuing to reach more and more people with the Gospel, both here and across the world. Our global-outreach ministries had taken on new life with increased emphasis given to our annual MissionsFest, significant overseas projects, like a major water system for a mission compound in Kijabe, Kenya, and the initiation of several short-term mission teams to various locations around the world. While the global ministry was growing, so was the need for additional space at home. Additional worship services were added, and Sunday school classes were being held in homes and public buildings in the blocks surrounding the church. In 1982 we added a new 55,000-square-foot Christian Education building, which required the demolition of two of our earliest structures. Four years later we purchased the nearby Christian Science Church to gain additional space. Through the 1990s and into the 2000s, God blessed the church with godly leadership and a strong commitment to the Word of God in our worship services, in children’s and student ministries, and in our expanding men’s and women’s ministries. Many came to Christ and grew in their faith through these open doors. In addition, several other significant events marked this period, including our new relationship with a small Baptist church in Deva, Romania. For many years they had suffered under the oppressive hand of a godless government, but with the breakup of the former Soviet Union, the believers were ready to implement the vision that they felt the Lord had given to them for the people of Deva and the surrounding area. Over the next few years we provided them with major funding so they could build a new church with a seating capacity of 1,300, and we sent several GO Teams to assist them in developing many ministry strategies. Meanwhile at home, under the leadership of our new senior pastor, Rob Bugh, we initiated a new contemporary service, which was held in our Fellowship Hall. The initial response exceeded our expectations—and the capacity of the Fellowship Hall—so within months we moved the service to the sanctuary. Three years later we added a second contemporary service to accommodate the growing need. Concurrent with the growth in these services we initiated a network of small Community Groups, designed to meet in homes on alternate Sunday evenings, with the goal of building community and growing faithfully devoted followers of Jesus. Initially we had an estimated 600 people involved in these groups, a number that has grown to more than 1,500 today. A third significant event of this period was not something that grew out of a strategic planning meeting but was clearly initiated by the Lord. A student at the Graduate School of Wheaton College asked if the church could provide space for ten or twelve people to get together to study the Bible in Spanish. We found the needed space, and from that very minimal beginning, God launched a vibrant and growing Spanish-speaking congregation, known today as Iglesia del Pueblo, that has its own identity but is a full partner in the total ministries of our church. From the mid-2000s to the present, the Lord has taken us through a major relocation and building program and has allowed us to be witnesses to the development of a significant new local outreach in multiple apartment complexes in West Chicago; the baptisms of hundreds of new believers in recent years; significant growth in our worship services, children’s, students’, men’s, and women’s ministries; an expanding network of community groups; the further expansion of our Hispanic ministry; an increased involvement in volunteer service; and the addition of many support programs to assist and encourage hurting people. This summer, Wheaton Bible Church celebrates 85 years of history, but any astute observer of our history would have to conclude that although we have many candles on our birthday cake, the church has defied the marks of an aging organization and will continue to be vibrant and alive as God blesses, and as His people are obedient in following Him. We are deeply grateful to God for all that He has done. This entry was posted on June 15, 2014 by Wheaton Bible Church in Summer 2014.